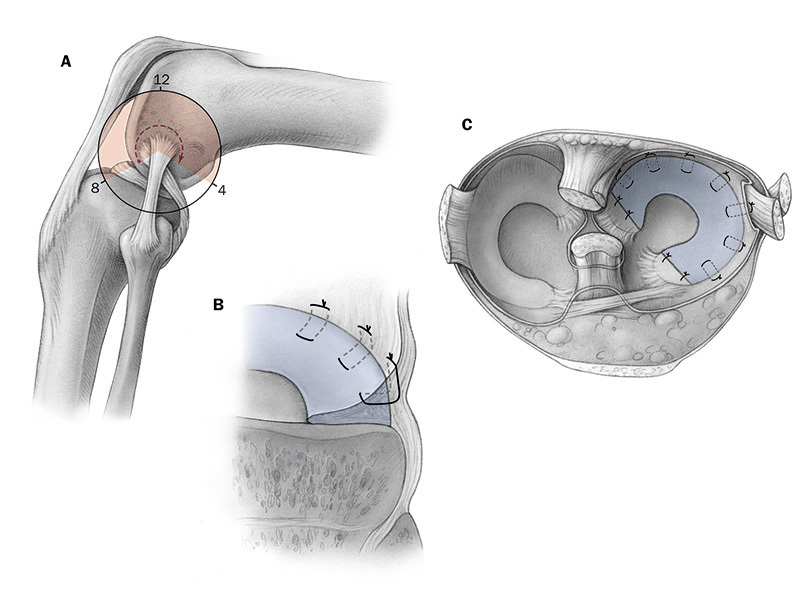 Created for the orthopedic surgeon readership, these illustrations clarify several steps in the surgical technique for viable meniscal allograft transplantation. The Journal of Bone and Joint Surgery’s spot colors are used to emphasize the osteotomy location and to highlight the allograft in each figure. A) To open the lateral compartment of the knee, the osteotomy bone block for release of the femoral origin of the lateral collateral ligament and the popliteus tendon is performed in a clockwise direction from 8 o’clock to 4 o’clock. B) Horizontal sutures are driven through the meniscal rim in an all-inside fashion. C) The meniscal allograft is tightly secured to the meniscal rim.